Sixty-four percent of once-overfished, monitored fish stocks nationwide have been rebuilt or made significant progress thanks to additional protections added to the federal fisheries law in 1996, according to a report released today by the Natural Resources Defense Council. Rebuilt fisheries are critical to healthy fishing economies. The report found that the increase in gross commercial revenues for the 27 rebuilding successes were worth a total value of $585 million annually (on average from 2008 to 2010). Recreational anglers have also benefited from rebuilding. Angler trips over the last decade along the Atlantic Coast, for example, are up 41 percent from the 1980s, according to the National Marine Fisheries Service (NMFS), and the recovery of important sportfish, such as summer flounder, black sea bass and scup in the Mid-Atlantic, has been critical to this success. In the Mid-Atlantic alone, the Fisheries Service estimates that the increased number of angler trips from the 1990s to the 2000s amounted to an additional $1.4 billion in economic activity and 18,660 jobs. Rebuilding all U.S. fish stocks will ultimately increase commercial fishermen’s dockside revenues by $2.2 billion a year—a 50 percent increase from 2010 revenues, according to a 2011 estimate from the NMFS. The total estimated economic benefits would amount to as much as $31 billion and 500,000 new jobs, as a result of growth in related industries, such as restaurants and seafood processors, wholesalers and retailers, according to NMFS. This recent success is particularly notable in light of the fact that many global fisheries are in decline. In 2009, the World Bank estimated that international commercial fisheries are losing $50 billion annually. By contrast, in 2011 U.S. commercial fisherman saw their highest landings since 1994, worth more than $5 billion, according to the National Marine Fisheries Service. Despite this success, a handful of legislators have repeatedly introduced bills in Congress aimed at weakening the federal rebuilding requirements. While the majority of the evaluated stocks have been successful in rebuilding, eight of the 44 stocks evaluated have made limited rebuilding progress, and another eight stocks have shown very little progress at all. These were disproportionately found in New England, South Atlantic and the Gulf of Mexico. The main reason for poor or limited rebuilding success in our report was continued overfishing of a stock while it was undergoing a rebuilding plan. The report also notes that many stocks have either received plans that do not satisfy SFA standards, or have not received rebuilding plans at all even though they may need them. This includes stocks lacking recent formal population assessments, stocks not under federal management plans, and stocks managed under international agreements. Mid-Atlantic: Excellent Progress (with a caveat) – In the Mid-Atlantic, six once over-fished stocks are now designated as rebuilt or meet rebuilding targets. These include black sea bass, bluefish, golden tilefish, scup, spiny dogfish, and summer flounder (designated as rebuilt in 2012, though the most recent assessment shows it still a little short of the rebuilding target at 95 percent). Of concern are the region’s species that are recognized to be significantly depleted but lack rebuilding plans because they have not been put under formal federal management, such as river herring, shad, menhaden, and Atlantic sturgeon. Pacific: Very Good Progress – In the Pacific, seven of eight overfished stocks are fully rebuilt or making significant rebuilding progress: bocaccio, canary rockfish, darkblotched rockfish, lingcod, Pacific Ocean perch, widow rockfish and yelloweye rockfish. The rebuilding of one rockfish stock, cowcod, continues to proceed very slowly, with a 2068 target date for rebuilding. New England: Mixed Progress – Of the 44 stocks analyzed in this report, nearly half—21 stocks—were from New England. Indeed, it was the collapse of this region’s groundfish populations in the 1990s, which was estimated at the time to have cost the region $350 million annually, that largely spurred the SFA’s passage. Today, 12 of these stocks are rebuilt or making significant rebuilding progress, including Acadian redfish, American plaice, barndoor skate, Georges Bank haddock, monkfish, red hake, sea scallops, scup, silver hake, spiny dogfish, windowpane flounder and yellowtail founder (southern New England). The remaining nine stocks are still struggling to rebuild. These stocks include the region’s two iconic cod stocks (Georges Bank and Gulf of Maine), two yellowtail flounder stocks (Cape Cod/Gulf of Maine and Georges Bank), Gulf of Maine haddock, Southern New England/Mid-Atlantic winter flounder, and white hake. 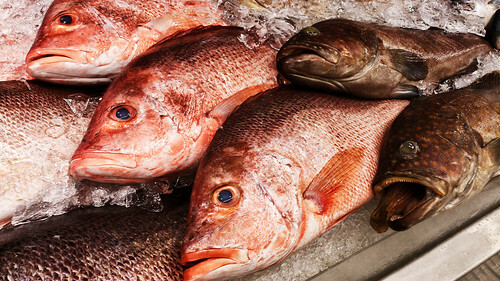 Continued overfishing is a key culprit of rebuilding shortfalls in most instances. Recently implemented annual catch limits in the region should allow these stocks to turn the corner. South Atlantic & Gulf: Poor Progress – Our report showed that the South Atlantic and Gulf of Mexico regions have seen the least rebuilding success. Only one fish stock from our report across the two regions—red grouper in the Gulf—has been successful in rebuilding under the SFA. Populations of four other stocks evaluated in the report—red porgy and black sea bass in the South Atlantic, and red snapper and greater amberjack in the Gulf—are recovering more slowly than anticipated (a new assessment due out soon for red snapper may show a brighter picture). The relative lack of success is due in significant part to continued overfishing during at least portions of the stocks’ rebuilding plans. There is also concern that many stocks in these regions have not received rebuilding plans, even though it is possible they need them, because of the lack of a recent formal population assessment. This includes some stocks that are widely recognized to be depleted, such as speckled hind and warsaw grouper. In the 1990s, many of the nation’s fish populations were in severe decline because of overfishing. The most alarming and publicized example was the collapse of many of New England’s iconic groundfish stocks, such as cod, haddock, and flounder. Without clear legal rebuilding requirements, short-term yields were prioritized over long-term rebuilding success, leading to continuing decline and degradation of entire marine ecosystems. To address this, Congress amended the nation’s federal fisheries law, the Magnuson-Stevens Fishery Conservation and Management Act, in 1996. Collectively known as the Sustainable Fisheries Act, these amendments require overfished stocks to be rebuilt to healthy levels in as short as time as possible, which should not exceed 10 years unless necessary due to the biology of the stock, environmental conditions or international agreement. Since 1996, the requirements have been applied to more than 60 stocks and in virtually every region of the country. This report demonstrates that the SFA has been an overall success. Rebuilt fish populations are essential to healthy marine ecosystems and coastal economies. In fact, depleted fish populations are the number one threat to ocean health, and highly depleted fish populations are more vulnerable to other threats, such as climate change, ocean acidification and invasive species. Meanwhile, robust fish populations can ensure that ocean ecosystems stay strong and resilient into the future. They also provide stability to the fishing industry, create jobs, increase recreational fishing opportunities and allow us to continue enjoying fresh, local seafood into the future. In addition to ending overfishing and rebuilding fish populations, ocean ecosystem health depends on protecting and restoring important habitat, minimizing the amount of unwanted species that are caught in fishing nets (bycatch), and ensuring an adequate food supply for marine life, including marine mammals. The full report is available online here: http://www.nrdc.org/oceans/rebuilding-fisheries.asp. A summary fact sheet with fishermen perspectives is here: http://www.nrdc.org/oceans/files/rebuilding-fisheries-summary.pdf.